In the United States, the fungus that causes histoplasmosis mainly lives in the central and eastern states, especially areas in and around the Ohio and Mississippi River valleys. However, it’s also present in other U.S. states, likely in small pockets that offer the right growing conditions. This fungus, Histoplasma, thrives in soil or other environmental material containing bird or bat droppings. Scientists are still learning more about where the fungus that causes histoplasmosis lives. This map shows the approximate areas (“endemic areas”) in the United States where we know or suspect the fungus lives. This map is based on the results of skin testing studies performed in the late 1940s and early 1950s.1 These skin tests detected whether a person who had lived in the same county for their entire life had developed an immune response to the fungus Histoplasma. The skin test is no longer available in the United States. The “suspected endemic” areas of this map represent positive skin test reactions that were likely due to Valley fever, a different fungal disease common in the southwestern United States. Histoplasma also lives in parts of Central and South America, Africa, Asia, and Australia. In some states, health departments collect information about histoplasmosis cases. This map shows the average rate of reported histoplasmosis cases per 100,000 people by county for 12 states with available surveillance data during 2011–2014.3 However, these rates cannot be directly compared across states because different histoplasmosis case definitions were used. On this map, cases are classified according to people’s county of residence, which might not be where they acquired the infection. Scientists believe that the fungus Histoplasma grows best under certain environmental conditions. This map shows the results of statistical modeling that estimates where this fungus might be most likely to live. 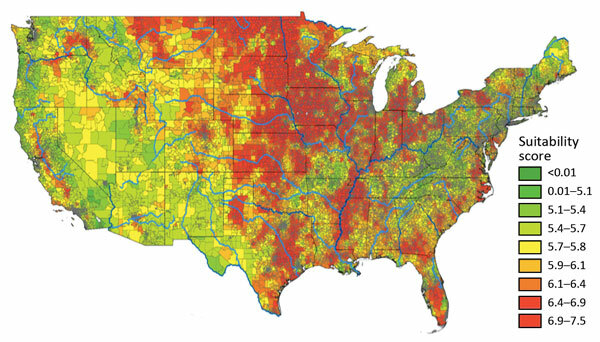 The model includes land cover, soil acidity, and distance from water, although other environmental factors can also affect where Histoplasma can live.4 On this map, higher suitability scores (in red) indicate areas that are likely to have better conditions for Histoplasma. It is important to recognize that this map is based on a statistical model and that all models have assumptions and limitations. More research is needed to better understand where Histoplasma most commonly lives. Manos NE, Ferebee SH, Kerschbaum WF. Geographic variation in the prevalence of histoplasmin sensitivity. Diseases of the chest 1956;29:649-68. Benedict K, Mody RK. Epidemiology of Histoplasmosis Outbreaks, United States, 1938-2013. Emerg Infect Dis 2016;22. Armstrong PA, Jackson BR, Haselow D, et al. Multistate Epidemiology of Histoplasmosis, United States, 2011-2014. Emerg Infect Dis 2018;24:425-31. Maiga AW, Deppen S, Scaffidi BK, et al. Mapping Histoplasma capsulatum Exposure, United States. Emerg Infect Dis 2018;24:1835-9.